Stats, Maps n Pix: What can explain Brexit? 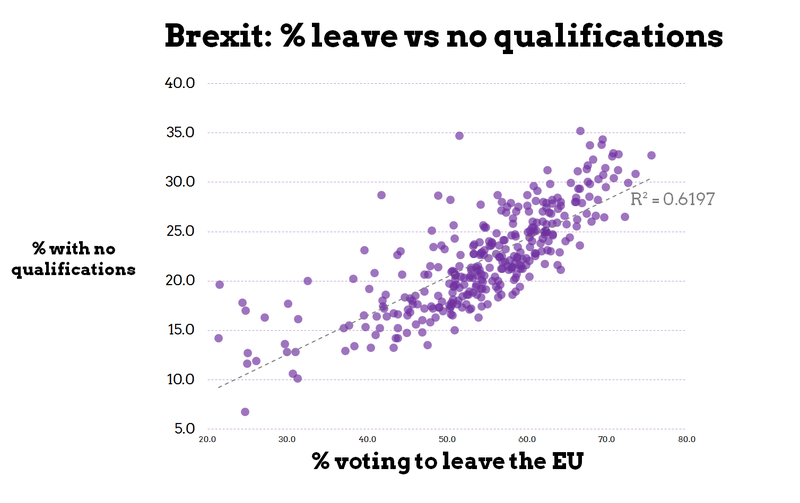 There have been enough maps, charts and infographics on Brexit already, so I'll just post three scatterplots here. I was trying to figure out what was going on, so I explored a few key variables that I thought might explain why people voted the way they did. I chose deprivation, lack of qualifications and higher qualifications, using 2011 Census data. I only focused on England here. Some of it has been done already by John Burn-Murdoch at the FT, though in a different (much nicer) way. 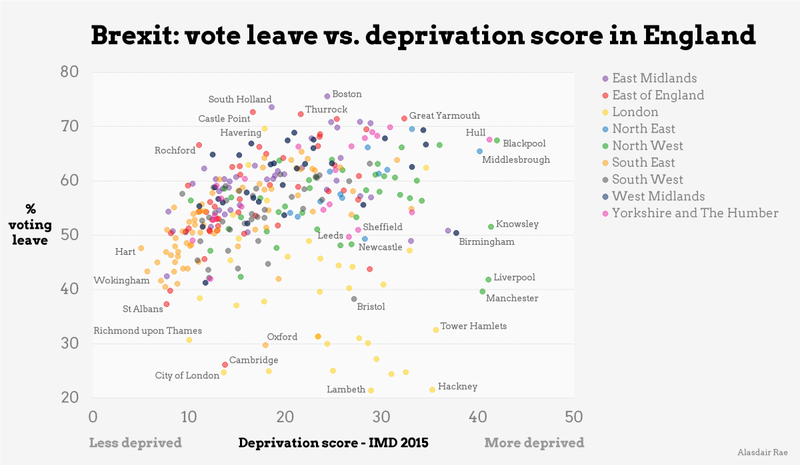 First, deprivation is - overall - not strongly correlated with percent voting leave at the local authority level (R-squared is 0.0369). 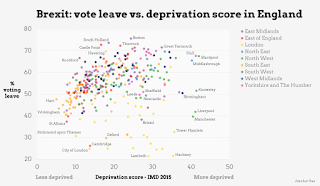 I used 2015 Indices of Deprivation at the local authority level in the scatterplot below, where I've also labelled some areas and coloured the points by region. 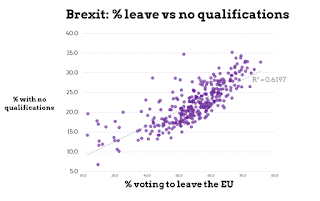 Next, I decided to look at whether the percent of people with no qualifications correlated closely with the percent voting for leave in each local authority in England. This was much more successful, with an R-Squared of 0.6197. Finally, I decided to see whether higher levels of education - rather than lack of education - was more strongly associated with the propensity to vote leave, and it is. 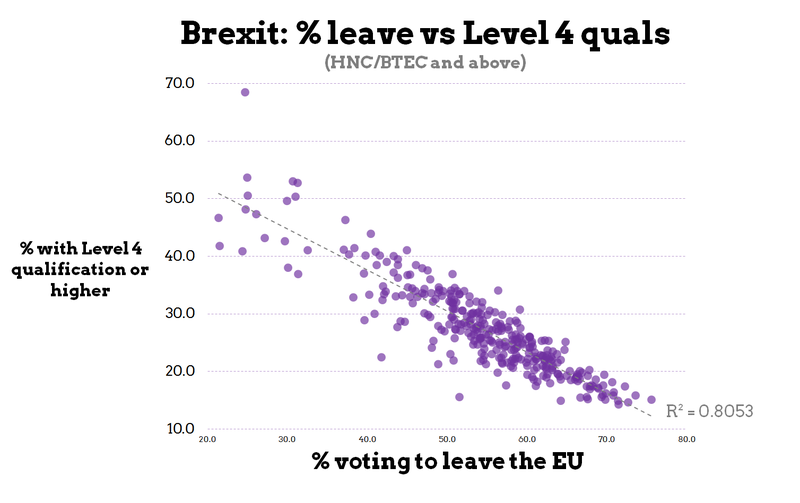 In the scatterplot below I compare the percent with Level 4 qualifications or above with the percent voting to leave the EU. This produces an R-squared value of 0.8053, which is really pretty high. This may not be particularly surprising, given what is known about the link between voting patterns and education but I think it's particularly interesting because of i) the historic significance of this referendum and ii) the people likely to be hardest hit by any post-Brexit economic downturn. Data sources: Census 2011 table KS501EW via NOMIS and EU Referendum data is from the Electoral Commission. I have shared the spreadsheet (and the Level 4 vs. % leave) here in case anyone wants to look more closely or make an interactive version.